Aseem Prakash is a professor in the Department of Political Science, and Walker Family Professor for the College of Arts and Sciences at the University of Washington, Seattle. Aseem Prakash received B.A. (Hons.) in economics from St. Stephen's College, University of Delhi in 1986 and M.B.A. from the Indian Institute of Management (IIM), Ahmedabad in 1988. He received a Joint Ph.D. from the Department of Political Science and the School of Public and Environmental Affairs (SPEA), Indiana University, Bloomington. 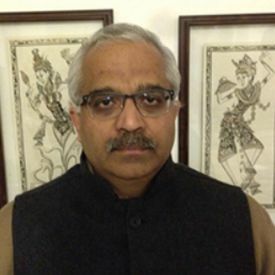 Prof. Prakash studies environmental policy, climate governance, non-governmental organisations (NGOs) and nonprofits, and voluntary/private regulation. He is the author of Greening the Firm: The Politics of Corporate Environmentalism (Cambridge, 2000) and has co-authored several others. In addition to guest editing several journal symposia, he has published in leading journals of political science, international relations, public policy, legal studies, nonprofit studies, and business. He also contributes to public scholarship via platforms such as The Conversation, Slate, Monkey Cage, Regulatory Review, and opendemocracy.